In December 1970 Elvis Presley apparently wasn't feeling too great about the direction America was headed in. If one wasn't aware, Presley was largely a conservative; a man who feared communists, the general tone around the Vietnam War, and the seeming lack of respect for the office of the President. And so, being the King, he assumed he could take such matters into his own hands and indeed planned on doing as much by taking his concerns straight to the White House. In December 1970 Presley's career was as big as it had ever been. The iconic one-piece jumpsuits debuted earlier in the year and the signature karate moves were now an even bigger part of his stage show. His shows at the Las Vegas International Hotel had sold out, set, and broke records throughout the year, but by the end of 1970 it seemed Presley's head was in a very different place. This brings us to the new film from director Liza Johnson, Elvis & Nixon, which discusses little to nothing about the music career of Elvis Presley, but more offers insight into the man Presley was outside of his well-known (and well-worn) persona. It's an interesting take and the film overall is a slight 86-minute excursion that strictly covers the how and why of this infamous meeting offering little to no commentary on the actual events leaving plenty of room for audience interpretation. This lack of any real angle, but rather pure intent to tell the story of a rather strange and unexpected set of events is admirable given today's highly peremptory society and especially considering the topic, but Johnson seems to care little for her characters actual beliefs or motivations, but simply accepts such feelings as fact and follows them with her camera to where such impulses led these actual men. Does this provide a compelling or complex film? 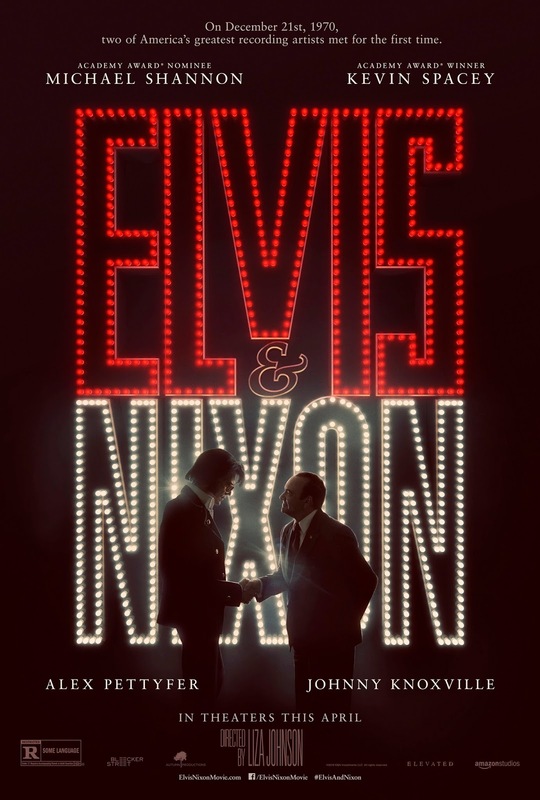 No, not really, but it would have been next to impossible to make a film of this meeting not interesting and at the very least Elvis & Nixon is an interesting and straightforward history lesson if not being as necessarily notable as its main characters. 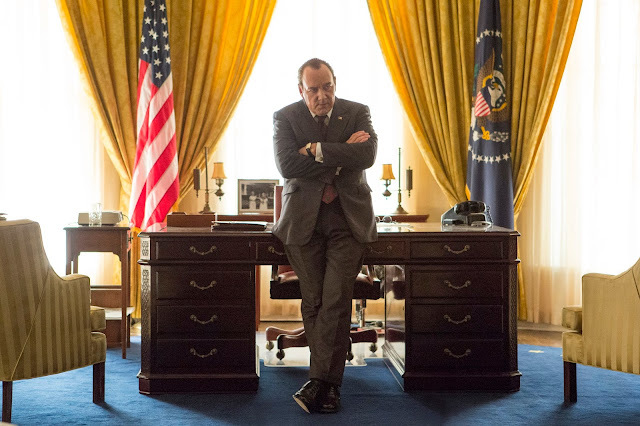 Kevin Spacey portrays President Richard Nixon on an odd, but unforgettable day in December 1970. From this description one might surmise that Presley was even more out of touch with reality than generally expected given his state of fame and what would ultimately become of the once hunky singer. While the debut of Presley on the Vegas strip a year earlier in 1969 would set the tone for a transitional gap between what it had been (the era of the Rat Pack) and what it would become (an indulgence destination where debauchery might go ignored) as Presley neared the end of his life he would become addicted to a variety of prescription drugs. There are of course several other factors that would lead to the singer's untimely death, but that Presley would become submissive to the thing that six years earlier he'd been determined to stop is not only ironic, but telling of the further psychological breakdown the performer would suffer over his remaining years. Presley likely knew his days as the King of Rock 'n Roll in the eyes of the public were numbered. Forget the invasion of The Beatles during the sixties, the Vietnam War had changed a generation who no longer found solace in the light pop ballads of Presley, but instead demanded more from their music. In light of the anger and passion spurned by world events the Woodstock generation of rockers and rebels was born. Maybe it was this shift, this realization that gave Presley the need to try and fight for his relevance, to resist the change that was so clearly coming. One has to imagine Presley realized he'd never be able to successfully go undercover, but maybe he didn't. Either way, it wasn't really the relevance factor that Presley was likely worried about, but the idea of losing power that scared him most. To be able to obtain a badge of such stature would seemingly grant him this "ultimate power" that would ensure he remained certified as such by the most powerful man in the United States. Whatever it might have been that led Presley to seek such credentials it is this behind the curtains aspect that is most engaging about Elvis & Nixon. As Presley, Michael Shannon single-handily steals the film with a performance that is not an imitation, but a portrait of a man who feels the need to live up to this thing, this idea that everyone else has of him rather than simply being the person he is under all that comes with being Elvis. 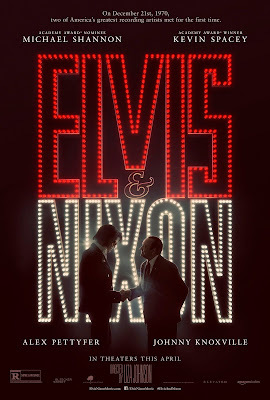 In Elvis & Nixon Elvis Presley (Michael Shannon) makes an impromptu trip to Washington in hopes of securing a Federal Agent badge from President Nixon. As a film overall, Johnson creates a portrait that more or less allows Shannon's performance to breathe and be the centerpiece of all he wants to do. Would this movie have worked without a performance at the level of Shannon's? Maybe-but it would be nowhere near as interesting or layered. There is a scene that takes place in a donut shop predominantly populated by African-Americans that is meant to display the disdain the black community had for Presley that is rendered an instant classic due solely to how confident Shannon is as he strides in and out of the situation. Shannon also shares a few quieter moments from the entertainer where he's not attempting to be as much, but rather is up front and real about all his life has encompassed. A heart to heart with Schilling mid-way through the film reveals the best reason for this film to be made in that it provides Shannon the first genuine opportunity to put on display who Presley might have been when he wasn't trying to keep up the facade. Another comes just before Presley is set to meet Nixon and is preparing what he might say to the President. In this moment Shannon recounts a true story from Presley's life that resonates how deep-seeded his beliefs about his talent are and how much he actually earned or didn't earn his position in the universe. If all of this adds up to one thing though, it is the fact that Presley was likely tired of being Elvis and that he would seemingly have done anything to not be seen as such anymore-even if it meant going undercover to protect the nation from anarchy. As for Kevin Spacey as Nixon he does a fine impression of the scandal-ridden President that never reminds us of Spacey's other Presidential role while offering a few amusing interactions with his Deputy Assistant Dwight Chapin (Evan Peters) and Administration Official Bud Krogh (Colin Hanks). While the first fifty minutes or so tell us the story of how this meeting was made to happen with the last twenty or so offering the interactions of the official meeting the movie as a whole, despite Shannon's great performance, doesn't reveal in effective enough form the moment in the Oval Office that was forever immortalized in the most requested photograph in the National Archives.